Streamroot started the new year off busy with the rework of the Streamroot DNA™ dashboard. Among the reasons why we upgraded the dashboard, the introduction of Compass to the Streamroot product line was a major deciding factor. We wanted to ensure that our philosophy of promoting exceptional user experience extended to all current and future products. So with the release of the new Streamroot DNA™ dashboard, we’re proud to now present the Compass dashboard where customers can configure our new multi-CDN switcher and monitor CDN performance. Compass is an automatic midstream client side CDN selector that allows your end users to source segments from the most optimal CDN, ensuring that each viewer has the best QoS possible. Our solution monitors each of your CDNs and implements the best one from each viewer’s device perspective. 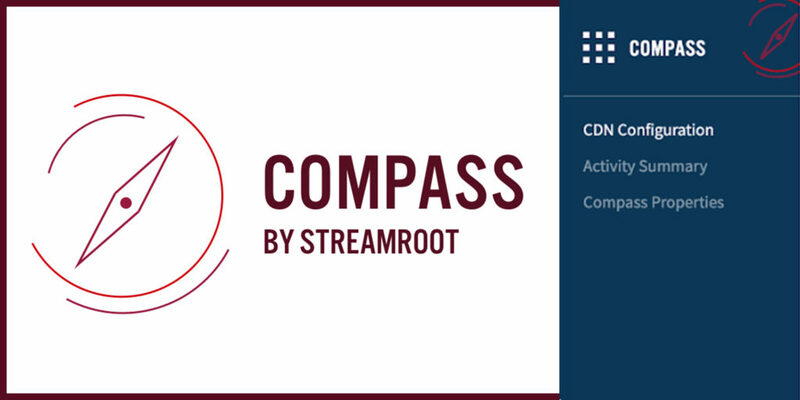 At the start of the session, Streamroot Compass selects the most appropriate CDN from the geographical and business inputs of your choice using Streamroot or a third party provider. During the session, our QoE-based selector takes CDN optimization a step further. For each segment request, Compass calculates current CDN bandwidth, latency and errors to assess whether or not a change should be made to improve quality or avoid potential congestion or failure. The next video segment request is then directed to the same CDN, or if necessary, redirect to a different CDN with a better QoE score. While all of this technology works behind the scenes, the Compass dashboard gives you the visibility and control needed to configure your preferences and monitor the performance of your CDNs. 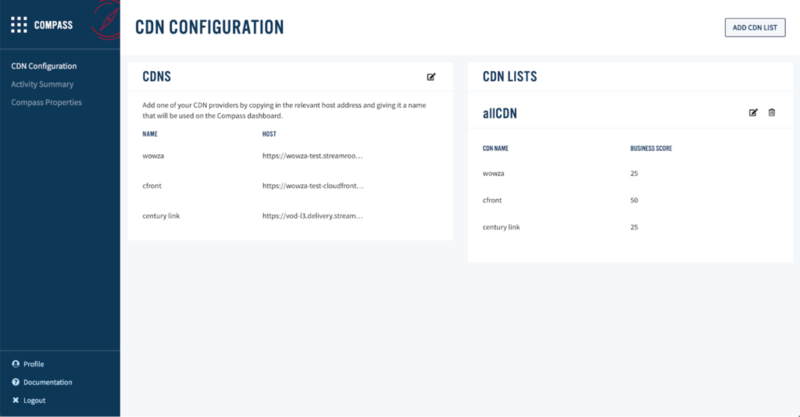 The dashboard currently has three sections where you can set up, regulate, and oversee your CDN activity. In this section, you can add your CDNs and define CDN lists to use for different parts of your traffic according to your business case needs. In every CDN list, you can assign an initial 1 to 100 score for each CDN to determine the weight given to each by the initial scoring algorithm. CDN list: Apply a specific CDN list that you created to a subset of your traffic as defined in your property. CDN score provider: Choose the input to determine the best CDN to use at the start of the session by selecting either Streamroot or a third party provider (e.g. Citrix, who we just partnered with!). Activation ratio: Primarily used for testing environments, you can set the percentage of traffic on which you would like to activate Compass. See Compass in action in the Activity Summary. Here, you can monitor and compare each of your CDNs and the switches that were made. Find detailed CDN information on the volume, error rate, concurrent viewers, and bandwidth over time for each of your designated CDNs. We look forward to introducing new features and sharing more dashboard improvements in the near future. To get early access to the new dashboard, contact our support team. Otherwise, we’ll be unveiling it for all customers prior to NAB. Not a Streamroot customer yet? Fill in the form below to request your free trial today. We’ll get you set up in no time to enjoy our new Compass product.